The Laramie Foothills Bison Conservation Herd is unique as it has successfully addressed three key challenges to bison conservation: genetics, disease and habitat. You can be part of the project: Donate here! 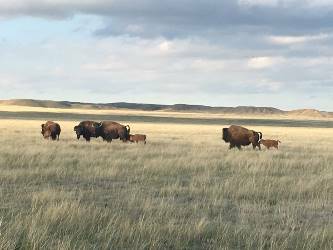 Visitors may see the bison in their pasture March-November (Soapstone Prairie Natural Area closes for the season in December, January, and February). There is no trail access to the pasture but you may see them from the road. The bison pasture is 1,000 acres, so the bison may not be visible. Stay on the roadway and out of the pasture for your safety and the safety of the bison. Directions: From Rawhide Flats Road/CR 15 junction, go about 4.5 miles north on Rawhide Flats Road and look to the west. More information is in the Soapstone Prairie site brochure. For thousands of years, the iconic American bison roamed the Great Plains by the millions until overhunting brought the species to near extinction. As part of a nationwide recovery effort, this keystone species was reintroduced to Soapstone Prairie Natural Area and Red Mountain Open Space. The Bison Welcome Home event in November, 2015 (Flickr album) celebrated this milestone with honored guests from tribal nations, dignitaries and bison lovers of all ages. This two minute video captures the highlights of the day, or watch a video of the whole ceremony (38 min.) The crowd stood mesmerized as the herd sprinted onto the gently rolling plains. The bison of the Laramie Foothills Conservation Herd are descendants of the Yellowstone National Park herd, notable for its valuable and unique genetics. The problem has been that the Yellowstone herd also carries brucellosis, a devastating disease to cattle that has been eradicated elsewhere in the United States. 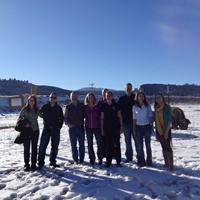 Assisted reproductive technology from Colorado State University and USDA Animal and Plant Health Inspection Service created disease-free embryos and offspring that preserve the Yellowstone herd genetics. Thus the genetics of the Yellowstone herd are no longer restricted to that area. Bison are resuming their critical role in large conserved areas of nearly pristine shortgrass prairie at Soapstone Prairie and Red Mountain. It is part of the vision outlined in Soapstone Prairie's management plan (2009). Species reintroductions are possible thanks to voter support of sales tax ballot measures funding land conservation and stewardship, thank you! A specially constructed fence allows wildlife passage and contains the herd. The bison are a native grazing animal in the shortgrass prairie and play an important role in maintaining the ecology. Cattle will continue to be at Soapstone Prairie because they achieve conservation targets by mimicking native grazers. The Natural Areas Department has leased grazing rights to the Folsom Grazing Association through 2020. Folsom Grazing Association has partnered with Natural Areas on several conservation initatives, including this bison project. Larimer County has a cattle grazing lease on Red Mountain Open Space with a local rancher. The project also offers a unique research opportunity, so Natural Areas is partnering with Colorado State University's Warner College of Natural Resources on studies to better understand the ecological response to bison grazing and the Denver Zoo to better understand the social value of bison on the conserved landscape. The group's findings will help inform future decisions about the natural resource and recreation management of the site. It is part of a collaborative One Health research project. The team includes Dr. Rebecca Garvoille, a conservation social scientist with the Denver Zoo's Department of Conservation and Research, Denver Zoo research fellow Todd Franks, Denver Zoo research intern, Ben Reidinger and Ph.D. student Kate Wilkins from CSU's Department of Fish, Wildlife and Conservation Biology. A Bison Homecoming is in the Works Coloradoan article. Colorado State University article and photos .